The Grumman F-14 Tomcat is a supersonic, twin-engine, two-seat, variable geometry wing aircraft. 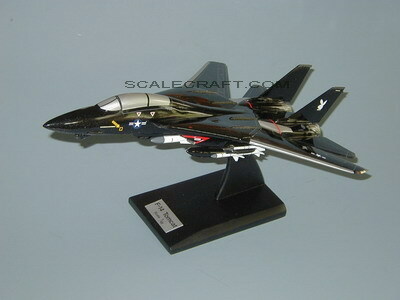 During its active service in the United States Navy (1972-2006) the F-14 Tomcat was the Navy's primary maritime air superiority fighter and tactical reconnaissance platform. It later performed precision strike missions once it was integrated with LANTIRN. It was developed after the collapse of the F-111B project, and was the first of the American teen-series fighters which were designed incorporating the experience of air combat in Vietnam against MiGs. It entered service in 1972 with the Navy, replacing the F-4 Phantom II. It was later exported to the Imperial Iranian Air Force in 1976. It was retired from the U.S. Navy fleet on 22 September 2006, having been replaced by the F/A-18E/F Super Hornet. As of 2007, it remains in service only with the Islamic Republic of Iran Air Force.